Renovation Analysis  Analysis of existing facility to determine deficiencies in code compliance, maintenance and upkeep, and determine usefulness of facility to meet current and proposed operational programs. Master Planning/Programming  Develop an architectural program for a new facility with phasing schedule conforming to available funding. 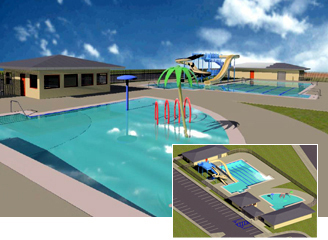 Architecture  Design of aquatic components, support buildings and associated site amenities. Engineering  Design of aquatic mechanical and plumbing systems, building mechanical and plumbing systems, and associated site utilities. Construction Administration  Provide services through the completion of construction to ensure contractors work conforms to the design documents and design concept. Using 3-D rendering technology enables JMAE to present detailed images early in the design phase prior to beginning construction.